But to return to Gleizes's conversion in New York, 'the revelation of Pelham' as his circle liked to call it. Mme Gleizes's offer of a cup of tea didn't do the trick and a religious conviction was to be the basis of all Gleizes's subsequent development. But the old leaven of his anticlericalism was still, initially at least, at work. His first port of call after the conversion could be seen as an extension of the world of René Ghil, the world of the similarly ambitious poet Oscar de Lubicz Milosz and his friend, the esoteric philosopher René Schwaller de Lubicz. Later he would be in sympathetic correspondence with the main contributors to Études traditionnelles, René Guénon and Ananda Coomaraswamy. (26) He nonetheless identified himself as a Catholic Christian, but a Catholic Christian persuaded that the Catholic Church had drifted into a materialist mode of thought after the twelfth century. Through the family of Juliette Roche, daughter of a powerful Third Republic minister (she had been brought up in the circle of the Comtesse de Greffühle and Robert Montesquieu, models for two of the chief characters in Proust's A la recherce du temps perdu) Gleizes had access to an excellent theological library, including many of the early Fathers of the Church. He was also mixing with members of the Sorbonne, including the leading physicist Paul Langevin and the circle who were coming to terms with the consequences of Einstein's theory of relativity (hence his use of the terms - also found in Aristotle - 'translation' and 'rotation'). He was particularly impressed with Etienne Gilson's La Philosophie au moyen age, published in 1922, with its emphasis on the transition from 'Realism' to 'Nominalism', which Gleizes saw as corresponding to the transition from the 'rhythmic' Romanesque art to the 'spatial' and figurative Gothic (Gilson was later to feel that he had exaggerated, or oversimplified, the Realist/Nominalist distinction). He had a particular admiration for Dionysius the Areopagite, John Scotus Eriugena and Augustine of Hippo. 'At bottom, without our being aware of the fact, it is a situation that presents certain analogies with the doctrinal conflicts of scholastic philosophy. For in the first group we can see the distinguishing marks of those who were called ‘NOMINALISTS’, who recognised as real only particular, individualised and consequently sensible entities just in the state in which they are when the senses have received them; and, in the second group, we can see the marks that distinguished those who were called by the name of ‘REALISTS’, who expressed all the individualised entities that the senses had brought to the consideration of the rational faculty in terms of general ideas, universal principles, a unity beyond reason. The Nominalists foreshadowed the coming of the classical state of mind, putting all their faith in the senses, while the Realists defended a tradition based on Intelligence. What do the present-day Nominalists defend? Where are our Realists headed without knowing? We have every right to ask the question and we even have some possibility of providing an answer. (27) Gleizes: Art and religion, Art and science, Art and production, pp.88-9. Gleizes developed the argument in a major study, La Forme et l'histoire, published in 1932. This was a cyclical view of history which did not allow for the specificity of any particular religious doctrine. Examples of religious cycles were taken from Buddhism, Hinduism, Islam, prehistoric times (Gavrinis in Brittany, New Grange in Ireland) and contemporary face tattooing in Tahiti, as well as from Christianity. Although Gleizes was an avid reader (and writer) he regarded anything, including religious teaching, that could be expressed in words as a second order phenomenon. What counted was the quality of the human act. This, together with his continued sympathy for Guénon and Coomaraswamy, was to cause difficulties for him when, during and after the war, he did enter into closer relations with the Church. 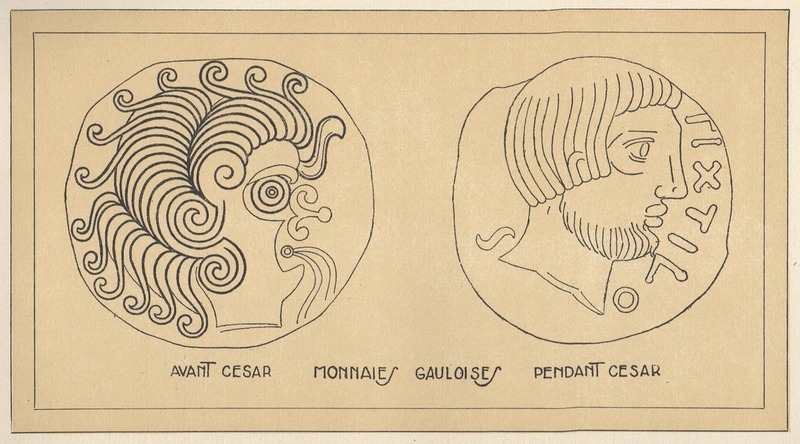 Illustration from La Forme et l'Histoire illustrating the contrast between a 'rhythmic' - in Gleizes's view religious - art and a 'spatial' classical art.